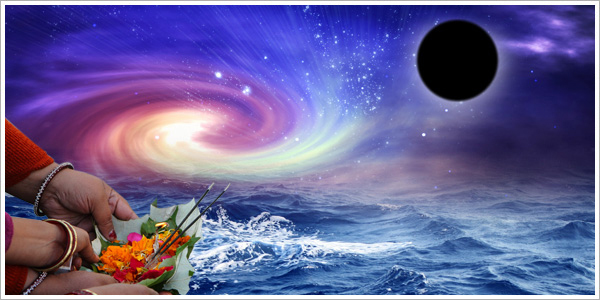 Mahalaya Amavasya or Pitra Amavasya is the new moon day of Pitri Paksha or Mahalaya Paksha, the fortnight which is especially sacred for offering oblations to the departed ancestors. Each day in the Mahalaya Paksha is ruled by a particular Tithi or Moon Phase and the benefits of offering Tarpan on each day are different. Each year on these 15 Moons, the Ancestor Spirits come and stay on the Earth plane. Mahalaya Amavasya 2016 falls on Sept 16th and it is the last day of the Mahalaya Paksha, which is considered as the most important day in the year for performing obsequies and rites and on this day people donate food, clothes etc. It is believed that performing Tarpanams or Tarpan during the auspicious Mahalaya Paksha will bless your ancestors and will free them from all their sins. Performing Tarpanam for your departed lineage is an act of great compassion. This is the most powerful way of honoring departed souls by making special offerings to thank them for their contribution to your life, and pray for peace to their souls. In turn you will receive their blessings which are all important for a peaceful and successful life. Great enlightened beings, who have turned their body into light, visit the earth daily in their light form. Our departed ancestors also come and stay on this earth plane for 15 days in a year in our body, mind and soul and can change all these 3 positively. Even Gods cannot do what these ancestors can do for you; in fact, Gods ask you to go through your ancestors for blessings. These auspicious 15 days, Mahalaya Paksha, in 2016 starts from September 16th and ends on October 30th.